← Even in the grey. I think my sister was right: “It is so weird to see you put black olives on your sandwich.” We were at Subway and I was loading my turkey melt with veggies (might I add avocado!!! Yum!) It is a little strange, considering that I spent my childhood trying every possible way to get out eating my veggies at dinner. “They are getting cold,” Mom would say. Truth is, I did that on purpose. They tasted more tolerable when cold. It was not until after college that I started to eat more outside my normal eating habits–maybe partial roommate influence (positive peer pressure if such an oxymoron exists) and the tumor growing on the 5th nerve causing a decrease in my smell–my view of food changed. No more “plug your nose while you eat…you won’t taste it” sort of fun. This is now my reality. Having no sense of smell changes your eating habits. Strange though, I can still smell coffee and can tell when there is BBQ cooking. I can taste the seasoning of Mrs. Dash and sea salt if large portions are applied to the food. I noticed I still tasted the ketchup on my potatoes tonight at dinner and the blueberries in my muffin this morning. So not all is lost. Growing up there were a few vegetables that I disliked the most: beets, asparagus, peas, and acorn squash–but especially asparagus!! We did not eat it often but when we did, it was awful! Fast forward to the year 2010, my roommate was having a birthday potluck/game night at our apartment. I had to work a late night shift, so by the time I got there, food was already served and the game was about to start. I remember walking in and smelling bacon (this is a few months prior tumor growth, so I still had regular smell at this point.) As I get my plate full of food, a friend asks if I want some of what he cooked: asparagus wrapped in bacon. I agree, but winced because I knew I did not like asparagus. As I ate it, I realized the bacon took most of the flavor. If I were a food critic, I would have starred it with a 4 out of 5 stars–only because the taste of asparagus was still not the greatest. That was the last time I had eaten the vegetable. Tonight we decided to put it with dinner: tilapia and potatoes and the asparagus. As I am trying to cut off the end, I am getting frustrated at their stems. “It is like bamboo!! !” Not that I have ever tried bamboo before but I was making a point. Mom suggested the food scissors instead of a knife. Brilliant. This is why I cook with her present in the kitchen! I start spreading the olive oil on with a brush that you use for applying barbecue sauce to your grill meat, while offering my next statement with a laugh: “Painting asparagus!” I had just come from the basement where I had been painting. Guess it was still fresh on my mind. Dinner turned out to be a delicious meal! Best part is, I can now add asparagus to my list of “veggie likes.” I think in part, because I did not taste the “asparagus” taste that had caused me to give a 4 out of 5 stars during the last experience. I chewed and looked outside thinking. “Hmmm, it tastes like green beans to me.” Then I add that I have a list of other vegetables I want to test–first up is eggplant. I cannot guarantee the same positive experience, but it is worth a try. Maybe that is the blessing of losing my sense of smell and altering taste: it takes me out of my eating comfort zone and into a kitchen full of possibilities. YUMMY!!!! I like asparagus, actually. The first time I liked it was at Mrs. Wheeler’s house when I was in middle school. I don’t know how she cooked it, but it was really good! You are right, we didn’t each asparagus very much growing up. I should cook it more myself. I think David likes it? See you soon! 🙂 xoxox. 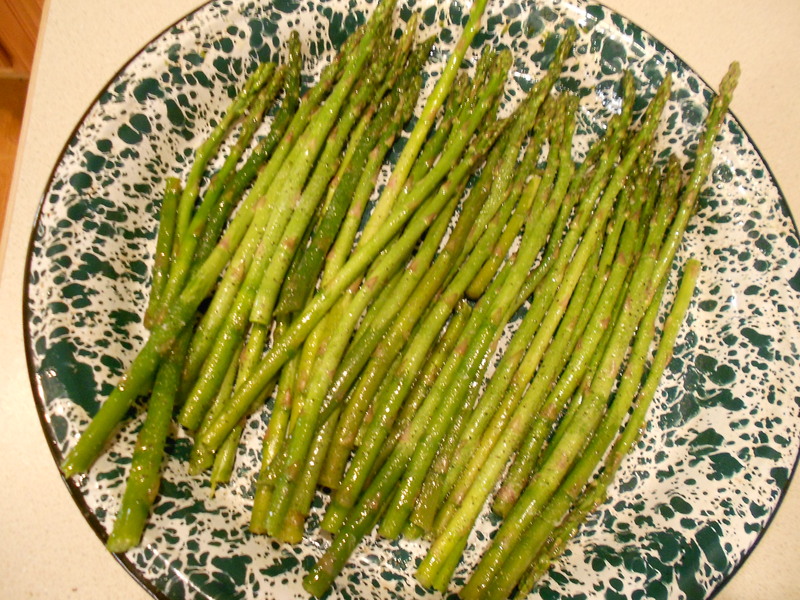 We love Asparagus and I actually like eating it raw:) Love when spring arrives! Thanks for the laughs! Breanna doesn’t like many veggies either!